Note:- In this article, among other things, I am going to spotlight on one of the most underutilized features of setting up Rule Criteria in Process Builder – ‘Formula Evaluates to True’; because ‘Conditions are met’ feature of the Action Group is used often, we are all well versed in it. But, how many of us have used it, or can, or know when to use ‘Formula evaluates to true’ feature of Rule Criteria? So, the next question is, when would one need to use ‘Formula evaluates to true’ feature to define criteria for Action Group? Any guess? In my last article Getting Started with Process Builder – Part 84 (Ever Needed to Select Multiple Picklist Values in Process Builder? How About via a Single Condition?! ), I discussed how a user can select multiple values of one picklist while defining the criteria in a single stroke. Thanks to all of you for your positive feedbacks! Well done guys, you learnt something new! In this article, I am going to discuss another problem that I recently faced, and share my experience – Process fails with “The flow failed to access the value for [example] because it hasn’t been set or assigned – If you created processes using Process Builder before then, you must be familiar with this error. Ah! Pesky! Let me unravel this mystery by offering an example: As a System Administrator, you receive a requirement to auto-update a Contact’s Description field (= Key Customer) whenever Account Annual Revenue is Greater than $10M. But wait! not so fast! For, you have not crossed the finish line yet!! Well, we are undaunted Salesforce Ninjas; so, let us march ahead and create a workaround to address the issue! Having defined the problem above, now let me share my trick to solve the above business use case using a simple CASE formula. Let us start with a business use case. There are few possible solutions for the above business scenario, but we will use Process Builder to solve the above business requirement. 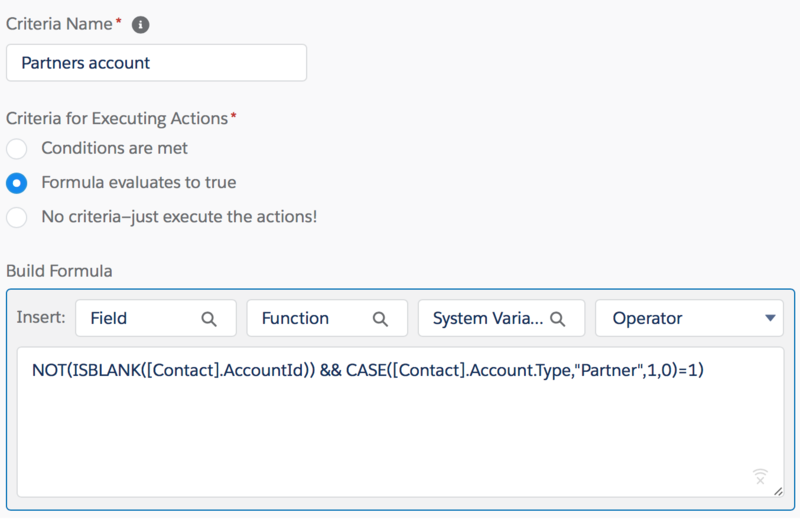 Before trying to understand the technical aspect of the solution, let us spend some time to understand the Case formula in Salesforce and how to use it. Do not forget to activate the Process by clicking on the Activate button. Next time, when Contact records are created, or updated, by the user, the process we created (Using Process Builder) will fire and check the criteria – if the Contact is not associated with an Account record – then it will not give the error, as shown in the following video. and, how to reference picklist values in Process Builder criteria node!! Yes, go ahead! Show off your newly acquired skills to your friends, colleagues and families! Please feel free to add constructive comments, insights – and yes, challenges too! – to the blog. Good Luck in your Journey towards becoming a Salesforce Ninja! Note: – I am thankful to Resco.net and Smartcloud.io for sponsoring my blog. What a great, helpful article. So well written an explained- thank you! I love highlighting great Salesforce blogs at the Maine User Group- yours will be well received I’m sure.